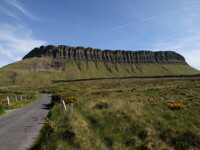 County Sligo (irish:"Shligigh") is located in the north-west of Ireland. 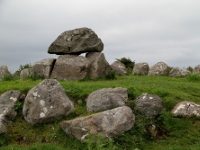 This relatively small county has huge variety of landscape as also is very rich in archaeological remains. Much of its scenery was carved out by Ice Age glaciers, creating in the south peaceful valleys and glittering lakes. 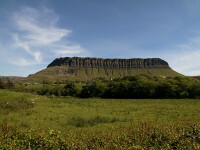 The northern part is dominated by limestone outcrops of Dartry range, of which Benbulben (also known as "Table Mountain") is the most famous and characteristic because of its long, flattened top. In the west of the county the Ox mountains form a background to the coastal plain. The low-lying coast has many beautiful, sandy beaches and low cliffs. 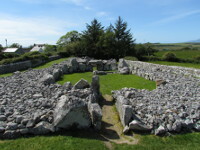 For those whose interested in Ireland's ancient past, County Sligo has a lot to offer, ranging from single standing stones to ancient burial monuments, castles, monastic sites and holy wells. 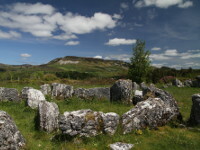 The Coolrea peninsula is home to very important Neolithic sites, including Knockrea Mountain with Queen Maeves Grave ( Miosgán Meadhbha) on its top and Carrowmore Megalithic Cemetery, of which earliest tombs may have been built 4300 BC, or 6300 years ago. 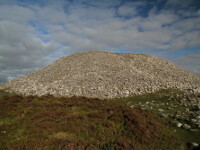 Another significant Neolithic burial complex is Carrowkeel Passage Tomb Cemetery, which is situated in Bricklieve Mountains, 30 km southeast of Sligo Town. 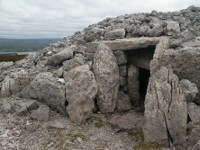 There are also many interesting single megalithic tombs scattered around the County Sligo, like for example Creevykeel Court Tomb or Deerpark Court Tomb. County Sligo is also strongly associated with the one of the greatest Irish poets, Nobel Prize laureate, William Butler Yeats. He chose the village of Drumcliff as his burial place. He died in France in 1939, and was brought back to Ireland in 1948. Since then, his grave attracts thousands of visitors. About 6.5 km off the Sligo coast there is Inishmurray Island, where you can find remains of early-Christian monastic settlement from the 6th century.